Lamborghini has decided to jazz up the already stunning Huracan supercar with the addition of three factory ‘styling packs’ to the range. These packs add stripes, bodykits, spoilers and new wheels without voiding the Lamborghini factory warranty. Of course, if you can ‘only’ afford the entry-level model in Lamborghini’s range, you might feel a bit short-changed by the lack of racy add-ons. If so, these packs are for you. The first styling pack on offer is the ‘aerodynamic kit’ – which adds a sportier front splitter, side skirts, rear diffuser and an enormous rear wing. The pack is the only aerodynamic adjustment allowed within the Lamborghini factory warranty – though the company says it’s purely an aesthetic addition and won’t bestow any extra cornering prowess. Think of it then like an M Sport, S line or AMG line package for a BMW, Audi or Mercedes – but scaled up to compliment the Huracan’s stunning looks. All the aerodynamic additions are made from a composite material and finished in matte black for a sporty look. The second offering is the ‘aesthetic’ package. This adds racing livery to the Huracan, in matte black, glossy black or red. Lamborghini says it won’t compromise the paintwork in any way, which should be reassuring for those who’ve spent £180,000 on the supercar. The final package brings high-tech race technology to your Huracan’s wheels with centre-lock wheel nuts. 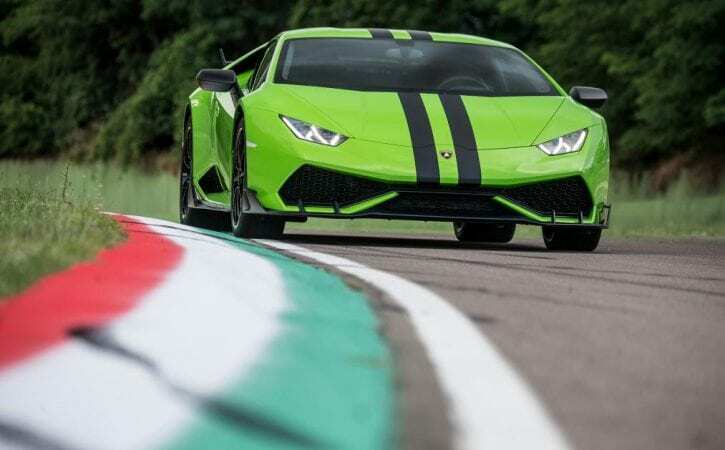 It’s normally a feature on high-tech track cars, but Lamborghini has introduced it to the Huracan in tribute to the lightweight Super Trofeo version. The new wheels come with the same design as the Huracan Super Trofeo but are compatible with standard 20” road tyres. The three styling packs are available from Lamborghini dealerships worldwide and won’t void the standard factory warranty.